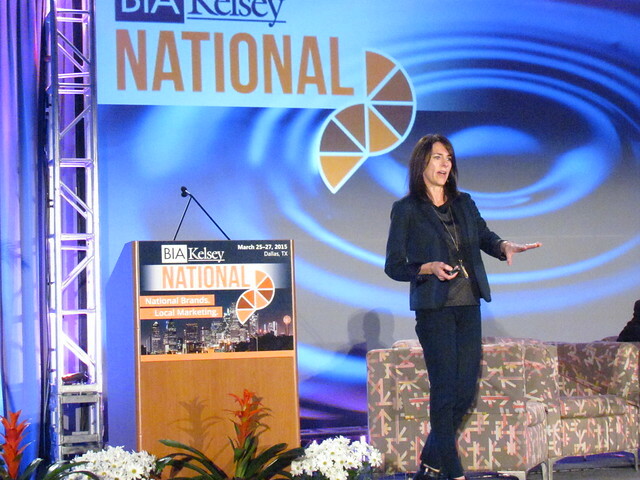 Karen Traversi Kovalesi, President & CEO, Geary LSF, a San Francisco integrated digital marketing agency, told BIA/Kelsey NATIONAL that marketers and brands must think across media and organizational boundaries to bring customers to a transaction decision. “You get business results, not just business tactics,” she said. “Omni-Channel is a mindset, not just a business practice.” Geary LSF must work to create unique combinations of digital messaging and engagements to bridge he national/local marketing challenge, Taversi Kovaleski told the audience, sharing examples from three industries, professional placement, healthcare and consumer products. “Local reigns supreme,” she said. “Brands get people to the door, but once they are engaged they are looking for something personal about the purchase — these are local decisions.” Even in B2B purchases, which many believe are fairly cut-and-dried standardized decisions, the individual wants to be informed very early in the process, which requires multiple messaging options to address the lead. In the consumer space, too, there are many touchpoint along the way rather than a single monolithic campaign “But many of our clients, we find, are not doing that,” she said. She pointed to three clients: Kelly Services; MedStar Washington Hospital Center, BumbleBee, the seafood company. Kelly is a global leader in workforce solutions. Over the past few years, the workforce Kelly supports has changed to emphasize skills over location — work can now be performed anywhere. Hiring companies no longer need to see Kelly reps. It allows Kelly to reach more potential business partner/customers through digital, which opens an engagement process that can be fulfilled largely online. Individuals doing the work, however, do like to talk to someone, to get the personal touch, so Kelly must balance its hiring company-facing messaging with local opportunities for business talent to connect and learn about the opportunities with Kelly.